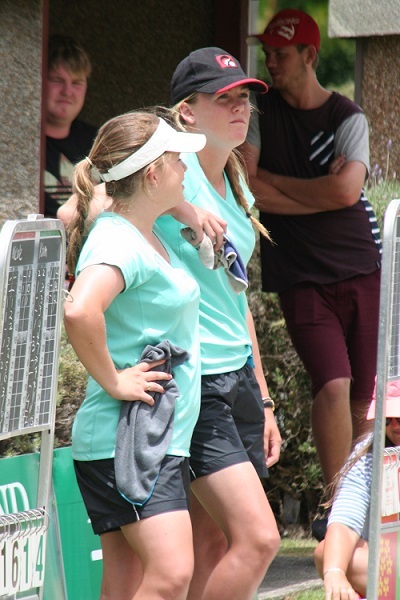 Nicole Toomey (Victoria) and Katelyn Inch (Oxford), both aged 19, came from behind to win their semifinal in the women’s pairs and this afternoon will play in the final against two other relative youngsters, the Boyd sisters of Burnside – Mandy, 23, and Angela, 28. It took Toomey and Inch, sixth and seventh year players respectively, 17 of the 18 ends to hit the front in the semifinal. Until then Karen Hema and Selina Goddard (Carlton Cornwall) had seemed the more likely winners. They grabbed a four on the 11th end to lead 11-7 and after 14 heads called the tune 14-9. But Toomey and Inch clawed back with two singles, and on the penultimate end, an invaluable five, when Hema took out Goddard’s only remaining bowl on the green after trying to improve a three shot deficit. Inch sewed the game up on the last end by drawing a back toucher with her first bowl. The Boyds had a surprisingly easy 19-7 win in their semi over the mother and daughter combination of Leigh Griffin (Victoria) and Kirsten Griffin (United). Both sisters were in excellent touch. From 5-5 after seven ends, they scored a two, a five and then a further brace to blow the game apart, the Griffins eventually conceding after just 14 ends. The women’s final will be played adjacent to the men’s this afternoon at 1.30pm at Browns Bay. The men’s features Rob Ashton and Petar Sain (Carlton Cornwall) against Richard Girvan (Onehunga) and Danny O’Connor (Birkenhead). The men’s singles final commences as 10am this morning, as does the women’s finale between Leigh Griffin (Victoria) and Elaine McClintock (Browns Bay).